Glennies Creek Dam is a popular inland sport and recreation destination near Singleton, offering year-round attractions for water sports and fishing enthusiasts, nature lovers, bushwalkers, campers and picnickers. Glennies Creek operates with nearby Glenbawn Dam to supply water for irrigation, environmental flows, stock, industry and household needs in the Hunter Valley. Walk across the dam wall for views of the lake and Mount Royal Range. The curved wall is 67 metres high and 535 metres long. The extensive lake foreshores provide many vantage points with panoramic views of the lake and rolling countryside. Carrowbrook Road along the eastern foreshore is particularly scenic. Open 24 hours a day, all year round. Singleton Council 02 6578 7290. Glennies Creek Dam is about 25 kilometres north of Singleton in the NSW Hunter Valley. Singleton is about 200 kilometres north-west of Sydney via the Pacific and New England highways. Lake St Clair’s extensive foreshores offer sites for unpowered camping with lake views. A camping ground on the eastern foreshore on Bridgman Road has powered sites, showers, toilets, boat ramp, electric and wood barbecues, and a camp kitchen. Water sports include skiing, jet skis, sailing, canoeing and swimming. The boat ramp is located at the camping grounds on the lake’s eastern foreshore. The lake is stocked with Australian bass. Golden perch (yellow belly) and silver perch are other top catches. Catfish and eel are also caught. 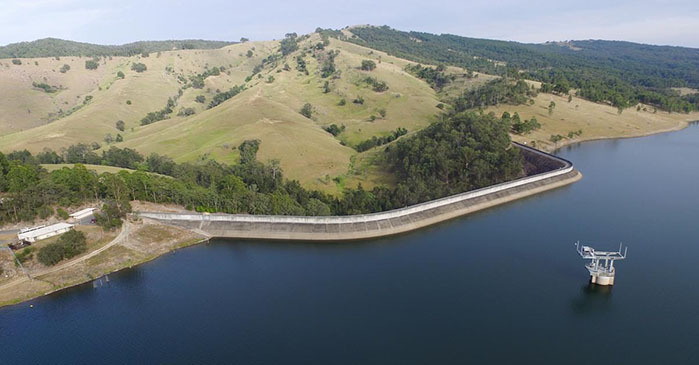 Glennies Creek Dam is 39 kilometres upstream from the junction of Glennies Creek with the Hunter River and about 25 kilometres north of Singleton in the NSW Hunter Valley. The dam is about 225 kilometres north-west of Sydney. Glennies Creek Dam has a capacity of 283,000 megalitres, about half that of Sydney Harbour. Glennies Creek Dam was built in the 1980s to supplement supplies from Glenbawn Dam in the Upper Hunter and meet increased demand in the Hunter Valley for water for agriculture, industry and towns. Vineyards and pastures for sheep and cattle are the main agricultural industries supported by irrigation. Glennies Creek Dam also provides water for nearby coal mines, the town of Singleton, and for domestic and stock use. The dam’s small 233 square kilometre catchment includes the Mount Royal National Park. Glennies Creek Dam is a curved rock-fill embankment wall with a concrete slab on the upstream face. The wall is 535 metres long and 67 metres high. An unlined rock cut spillway is located just south of the dam wall. The cutting provided all the rock-fill needed to build the dam wall. A 60 metres high control tower with variable inlets allows for control of the quality and temperature of water released from the dam. Construction began in 1980 and finished in 1983. Range - 0 to 350 megalitres per day. Trigger - When flow increases above 350 megalitres per day. Trigger - Spillway flows (uncontrolled*) more than 0.5 metres over spillway. Trigger - Spillway flows (uncontrolled*) more than 1 metres over spillway. * refers to automatic spillway flows at ungated dams once storage capacity exceeds 100%. Trigger - Spillway flows (uncontrolled*) more than 1.4 metres over spillway. Notification - You are advised to make preparations in case there is a need to evacuate in the future. Trigger - Storage level has reached top of intake tower. Trigger - Storage level has reached embankment crest level.